Color Factory is a two-story, pop-up interactive exhibition celebrating color and material dreamed up by some amazingly-talented friends of mine, Jordan Ferney, Erin Jang, Leah Rosenberg, and the team at Oh Happy Day. smell colorful memories, and taste a spectrum of treats from our favorite stops in San Francisco. The pinks will delight you, the blues will amaze you, the yellows might make you hungry. Jordan called on my friend + super talented prop stylist, Randi Brookman Harris, to bring her brilliant mind to create a memorable exit through the gift shop. So after you swim through a giant sea of yellow balls, there's a tasty yellow treat + an all yellow souvenir shop-of-sorts for you to further indulge in. Randi reached out to help her cull together, edit, and stock the items for the shop as well as some additional assistance for making it happen. I dropped a line to my friend Megan Soh, who was of major assistance on Nearly Impossible, as I knew this would be right up her alley. And it was! Together we worked through spreadsheets and line sheets to bring Randi's product vision to fruition in a matter of weeks. While Megan sorted out the final orders, I turned my attention to the buildout; working with Randi and the Color Factory team, we designed wallpaper and fixtures for product displays. 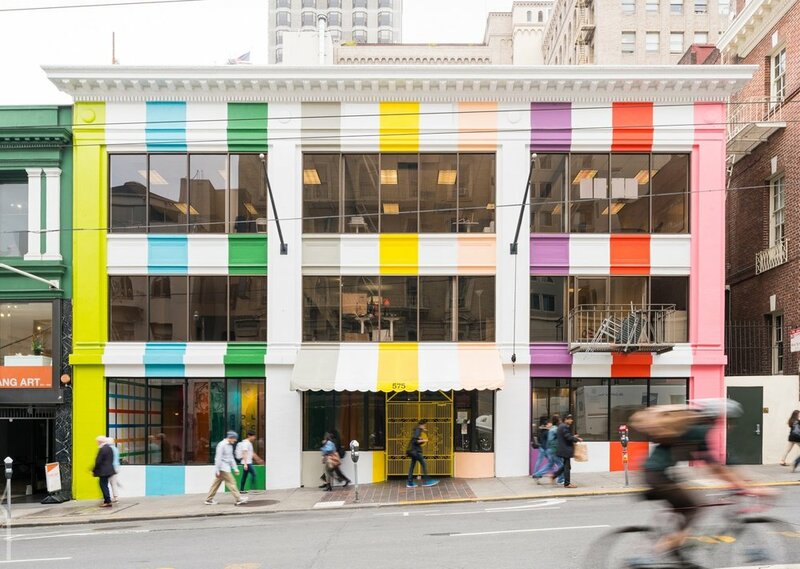 Randi flew out to San Francisco to style and merchandise the shop as the rest of Color Factory came together in August 2017.